I somehow haven't shared as many English Paper Piecing projects on here as I would have liked; I think it's due to the fact that as the process is much slower, projects take much longer to finish than dressmaking. However, I would like to write more about English Paper Piecing as it is something that I really love doing. 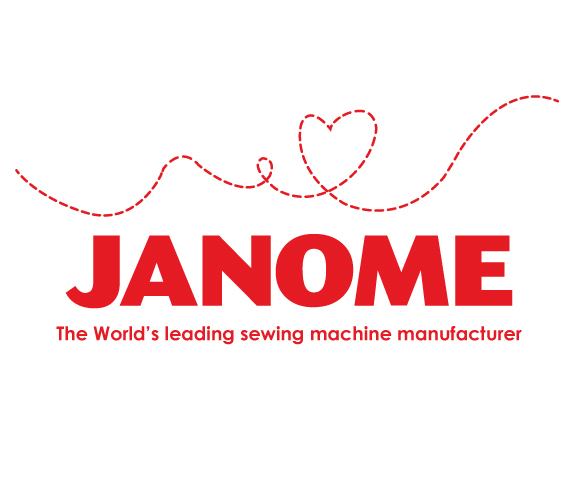 If you aren't familiar with it, you can read a great post all about what English Paper Piecing here, written by Flossie Teacakes. Her blog is actually how I discovered what English Paper Piecing is (which I will shorten to EPP from now on as it is infuriatingly long to type!) so if you don't know what it is and would like to find out, I would highly recommend reading it. I started EPP about 1 1/2 years ago, and I loved it as soon as I started. I find it's such a relaxing thing to do, and it's perfect for evenings spent watching TV. It's also much more transportable than dressmaking (obviously!) and I can bring everything that I need for a project away with me in an empty chocolate tin or ice-cream tub. 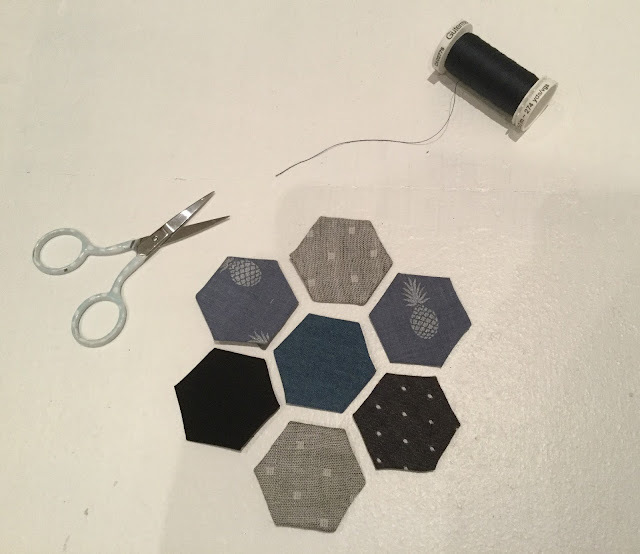 I always have a lot of EPP projects on the go, but the one that I am currently working on is a very simple one, which uses hexagons, probably the most basic EPP shape. What inspired this project was the large number of scraps that I accumulate from fabric from leftover dressmaking projects. Scraps that are the worst size possible - those which are too small for another garment, but too big to throw away. This is why EPP is perfect, as it means you can use small scraps of fabric. Fortunately (in some ways), my handmade clothes nearly all follow the same colour scheme - blue and grey! This means that although there isn't a lot of variation to my wardrobe, all my scraps from my dressmaking projects go well together. 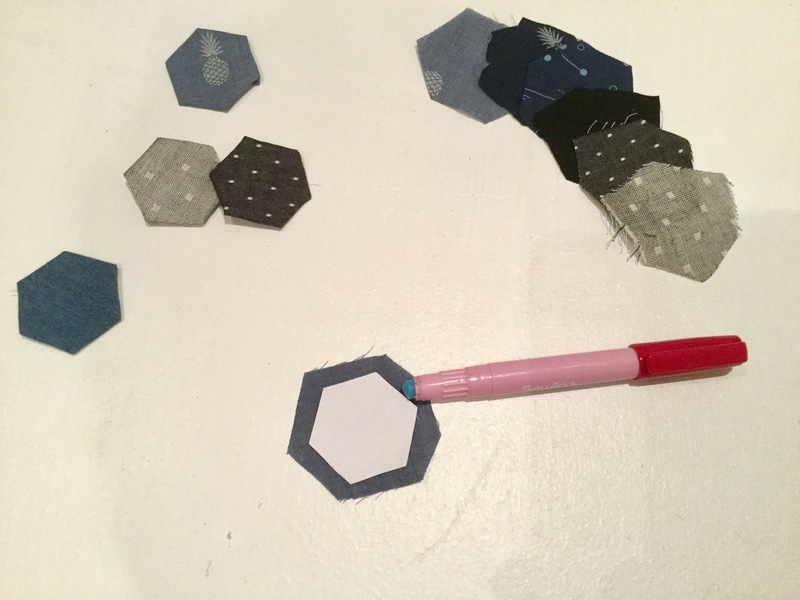 I selected 7 different fabrics and cut out hexagons from them. The main thing that I wanted to make sure of was that I was only using pieces of fabric that couldn't have been used for much else, and I left any larger pieces alone. You might recognise some of the fabrics from my pineapple trousers, my pineapple top, my black Arum top, my Dad's shirt, my navy blouse, my grey Arum top and my Rosa shirtdress. I think it's fair to say that I've succeeded in my mission to use just leftover scraps! Like with a lot of my EPP projects, I'm not entirely sure where this one is taking me. 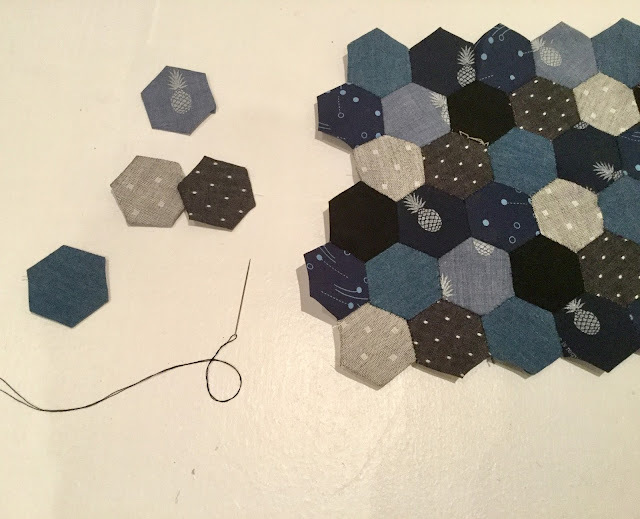 You can see from the photo at the top of the page that all I'm really doing is just sewing hexagons together. I don't know if at the end I'm going to frame it like this one, or I might make it into a cushion. I like that I don't actually have to do anything with it, it's not following a pattern so there is no end to it. For now, I'll just enjoy sewing it all together! Handwork is fun and relaxing but so very time consuming! I've been working on a hand embroidered quilt for my son now for EIGHT years. I never planned on it being this long of a project though. Somehow life gets in the way and it takes a backseat for weeks or some times months. I think I see the light at the end of the tunnel though. My goal is to finish within the next year (or two) ha ha. I'd never heard of this before. It looks so beautiful. It's definitely a great way to use leftover fabric. I can't wait to see the finished product.